NorthStarr’s Notes: In the past, educational institutions used printed brochures for course descriptions etc. However, Stanford University’s Arts Intensive program has adopted an Eco-friendly paperless approach. They use an Online Brochure that intertwines videos on selected pages.(http://content.yudu.com/A1rfbb/AI11TAB/resources/index.htm?referrerUrl= .) On the intro section there are still graphics that provide information about how long the classes are in session, with a link to where the students can sign up and information about the deadlines. Their promo video is broken up so that part of it plays on the intro and the first page (see our blog section promotional videos for more information on promo videos) there is also a table of contents and a written over view on the Arts Intensive program. Page three explains the Acting Intensive course with a bio about the Instructor. 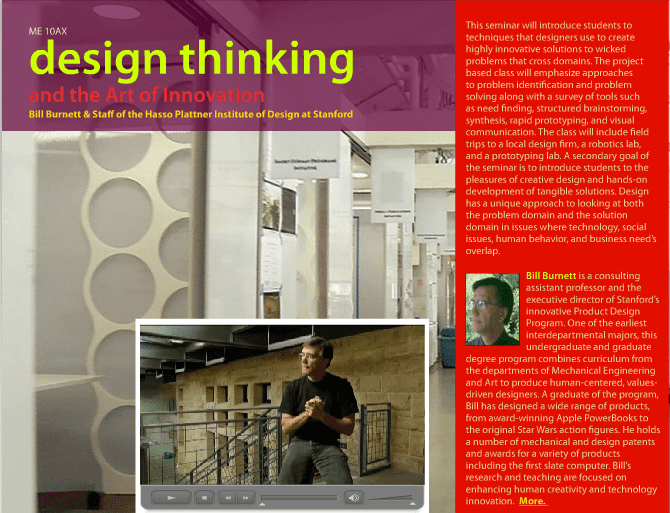 The video about this section of the program is on its own page with a still image taken from the video and some graphics. The following pages also use the combination of still graphics, text, video and still images. Page four explains the Ballet Intensive, six breaks down the Design Thinking class. Page nine introduces the Film-making course. The other pages provide information utilizing graphics, text and still images only. Online Brochure doesn’t only provide an environmental value but also from a marketing perspective and economic growth potential. We know that printed brochures have a shorter life cycle. In the old model, educational intuitions printed X amount and people might keep them for a short time and some might immediately throw them away if they aren’t interested. Depending upon how many times this happens, it can weigh heavily on a school’s marketing dollars. The printed version doesn’t have the same reach potential either. In the case of the online version, if someone comes across the AI brochure and they aren’t interested in the program, they don’t lose any money. Also they’re stored online so they will be available for as long as they desire. There is no competition when it comes to the potential people that these online brochures can reach. With print there is most likely a designated area at the school that houses them, perhaps there is a mailing list. We know that the internet is endless and if planted properly the awareness of the Arts Intensive program can truly soar. Some of the ways in which this can be done is by utilizing email blasts, blogs, websites and social sites as an example. This makes the probability great that the economics of the program can benefit. The more students and or potential students learn about the AI program, the greater possibility for increased registrations. Video Brochure marketing isn’t only beneficial to educational institutions, they can be useful for any brand, company or non-profit. It’s merely a different way to market and spread the word about your product or services while taking an Eco-friendly approach.